The first step in assessing any Japanese knotweed problem and the need for root barriers is a Japanese Knotweed Survey. You can request a survey using the form on this page or contacting us directly. Following the survey you will possess information to understand the extent of any infestation and the appropriate action to take. Root barrier membranes are used to prevent the spread of Japanese knotweed. To install root barrier membranes it’s best to use a specialist contractor, such as Japanese Knotweed Ltd, as a root barrier is only as good as its installation. These are the most common and rely on forming a barrier which the plant cannot penetrate. These barriers are normally made of interwoven reinforced polyethylene. They will resist and deflect the growth of knotweed unless they are punctured. It is therefore essential that barriers are installed properly and shuttering or blinding layers installed to either side of root barrier if there is a risk of stones etc. puncturing the membrane. These are less common and Japanese Knotweed Ltd only advocate the use of permeable barriers that have a copper foil layer within them, unless the knotweed has been pre-treated. A copper foil woven into the fabric of the root barrier membrane will prevent growth of plants through the permeable materials of the barrier as plants are adverse to the chemical scent/signature given off by copper. Other permeable membranes (such as geo-separation membranes) are not sufficient to withstand knotweed growth unless the knotweed has been previously treated with long term chemical applications or following excavation and sifting. Vertical Root Barriers are often installed to help prevent encroachment of underground knotweed rhizome from neighbouring land. The root barrier is usually installed to a depth of 1-2m by digging a deep trench as close to the boundary as possible. The installed barrier is sealed to the boundary where possible. The trench is back-filled taking care not to damage the integrity of the root barrier. Non-Permeable root barriers are most often used for vertical installations. 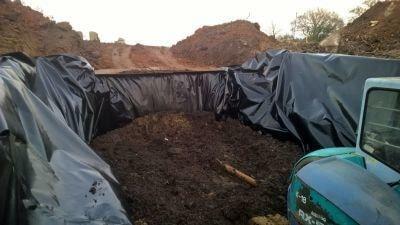 Horizontal root barriers are used in the capping of Japanese knotweed contaminated ground. This will have happened where it’s not been physically possible, or desirable to excavate to the full depth of the Japanese knotweed rhizome. This will leave knotweed rhizome contaminated ground in-situ and this ground can be capped off with root barrier to prevent any re-emergence of knotweed from beneath. This method can be used on construction sites as well as residential properties. 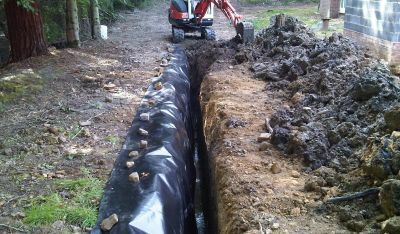 Permeable root barriers are most often used for horizontal installations to allow for percolation of water through the barrier following installation. When Japanese knotweed waste is buried on site at a depth of less than 5m the buried waste must be encapsulated in root barrier (forming a parcel or cell of buried knotweed). A burial pit is formed and lined with root barrier (and protecting sand blinding layers or shuttering where necessary to prevent puncturing) before waste is brought into the pit. Once all the waste has been moved in, root barrier is laid over the top of the waste and secured to the pit lining root barrier to form a secure parcel or cell of root barrier with the waste within. Non-Permeable root barriers are most often used for burial installations. Approved root barriers for use in Japanese knotweed applications should have a life span of at least 50 years. Correctly installed these root barriers will deflect knotweed growth. The weakest point of any root barrier installation is the joins between root barrier material lengths and widths. Joins can be done in the factory so that a pre-fabricated sheet of root barrier is delivered to site to a specific size without the need for field joins. In most cases however it’s necessary to complete joins of root barrier material in the field of work. Where possible non-permeable root barrier joins should be made using heated butyl to form a secure seal (adhesive tapes should be avoided unless used in conjunction with robust interlinking folds between the two membranes, or with significant overlaps between the two membranes). Permeable root barriers most often than not cannot take heated butyl and therefore these need to joined using secure and robust interlinking folds secured with adhesive tapes. A Knotweed Management Plan for the site should be used to record the location of vertical root barrier installations and the location, area and depth of horizontal and burial root barrier applications. This will help avoid any accidental disturbance of the root barrier following its installation. Root barriers are not usually used in isolation to treat Japanese knotweed, but in conjunction with other treatment methods, such as excavation or herbicide treatment.